The day after our March, it was time to change gears a bit and recover. After a satisfying breakfast, it was time to head off to Bermondsey, meet up with Death Marchers that remained ambulatory, and do the Bermondsey Beer Mile, adding another handful of miles visiting eight different breweries as we relaxed from the previous day’s hike. 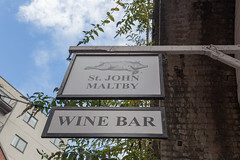 However, mid-way through our Beer Mile, we ended up back at the Maltby Street Market for a short lunch break. While there are many great food options to be had there, like 40 Maltby, this time we had a more specific destination, and menu item in mind. It was finally time to get a bacon sandwich from St John. Most everyone is aware of the famous Restaurant St John, or their sister restaurant, the more laid back St John Bread and Wine, which a reviewed back in 2008 after a most awesome roast beef dinner there. 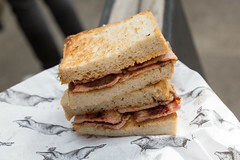 But St John Bread and Wine is also particularly well known for having one of the best bacon sandwiches, so when I noticed in 2016 that Maltby Street Market also had a St John location, I was most interested in seeing if they too had an excellent bacon sandwich. It was a bit of a wait for a takeaway sandwich, and a much longer wait for a table, but really, it wasn’t all that packed. About 5 minutes after ordering my Rare Breed Bacon Sandwich, I was handed a surprisingly hefty takeaway bag and headed off to meat my friends down at the end of the market. The sandwich itself is truly an example of simplicity of construction, since there are exactly three ingredients in this sandwich: bacon, bread, and a bit of butter. That’s literally it. No spreads. No herb sprinkles. No vegetables. No condiments. But therein is the genius, since the actual components were that good. The bacon was two rich, meaty slabs of Old Spot back bacon, cooked just to the point where the fat crisped and then fried up for just a bit of browning on each side. This just ooozed a perfect, rich, salty, and satisfying pork essence with every bite. Add in two slices of thick hearty white bread toasted just to the point of light crunchiness, with just a hint of butter, and this was pretty much the perfect bacon sandwich. Last weekend, we had a free day, and decided to us this opportunity to go see some of the fall colors (due to our trip to Miami, most of the leaves will be gone by the time we get back). After discussing many possible destinations with good colors, we settled on Bennington, VT. We were planning on eating at the Blue Benn Diner (which gets really good reviews), but, unfortunately, the Blue Benn had a kitchen fire and was closed for several days. The guy in the parking lot recommended the Northside Diner as a good alternative.